The New Year dawns . . . all those resolutions to keep and cycling miles to get in - and training if you are planning your E2E this year. 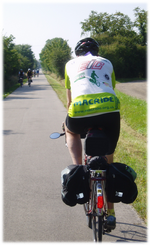 If you are looking for a weekend training ride why not join this year's MacRide Tour? - it's a fully supported ride of about 100 miles over a day and half from London to Stratford-upon-Avon .. everything's organised for you, including overnight B&B accommodation ... and we even have an event jersey. Just CLICK HERE (new window) to go to the website. Almost the end of the year and for many cyclists the first thoughts about planning THE BIG RIDE for next year .... if it's going to be an End-to-End don't forget to have a bowse around the site for information and inspiration . . . and then to list your ride dates.
. . . and a plug for the JOGLE/LEJOG map book and guide that you can get in return for a donation to Macmillan Cancer Support - just CLICK HERE (new window) to order online .... and our book, Wine-ding Down Through France, the story of Rob & Jon's French ride in 2008 - CLICK HERE for more and to order online. You may Register (or log in to the site) for an account, via the Register link in the Main Menu on the left. Registered users may have access to restricted content or other features - as well as being part of the "Cycle E2E community"
The Journal of Rob & Joe's JOGLE - which has become a popular resource for riders. The complete route book (as a marked map) is available for a donation - order your copy on CD from the online shop. CTC's Cycle magazine will be featuring an article on four very different End-to-End rides in the issue due out in late 2010. Cycle - End to End is getting a mention and it is planned to reproduce the article (with permission) on the website when the magazine has been sent to subscribers. Michael Moore has just posted the Journal from his 17 day solo LEJOG, undertaken in 2010 at the age of 65. He was supported by his wife in the car and used the CTC YHA route as a basis. What makes Michael's Journal different is the detailed and comprehensive day-by-day, turn-by-turn route guide - you could print the pages, jump on a bike and follow the route. In addition there is also a .zip file containing a complete set of .gpx files. Go to The Journals, LEJOG and see No 565. New for 2011 : riders will be able to use Cycle End-to-End to "blog their ride" - sending updates from the handlebars for friends, family etc to follow progress. A simple e-mail from a smartphone or other internet access will publish text directly to the rider's own section of the website - and it'll be live within 15 minutes. The webmaster is back . . .